Following up from the successful “Fun with Felting” workshop held last year as part of the Wearable Art project, the Ravensthorpe District Art Group (RDAG) organised another fantastic felting workshop, this time to learn the technique of Nuno Felting. 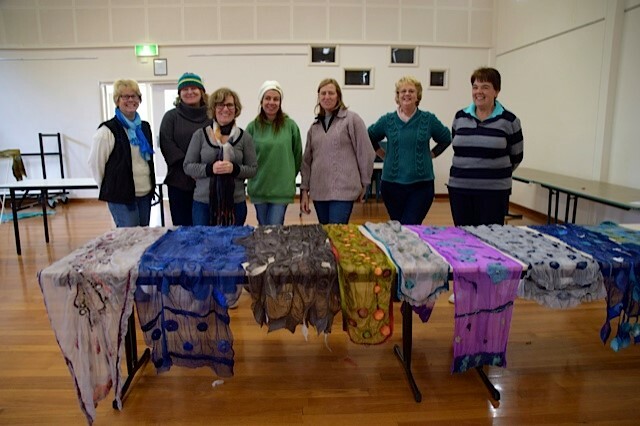 Partnering with the Ravensthorpe Regional Arts Council (RRAC) as part of their annual artistic programme, the RDAG invited Felt Artist Lynley Campbell from Albany back to Ravensthorpe on the 28th and 29th of May 2016. Our venue this time, the Ravensthorpe Town Hall. Somewhat chilly, however all participants were warned to wear thermals and beanies! Brenda saved the day with a heater and we all warmed to the tasks at hand. So what is Nuno Felting? It’s a fabric felting technique where wool or fibre is felted through an open weave type of fabric. Almost any open weave fabric will work for nuno felting. In this workshop we used silk chiffon which yields a drapey, lightweight fabric. Of the eleven “students’, some had participated in the last workshop, some had past experience and some were totally new to the concept. Lynley had inspiring samples of her own work to show what results could be achieved. 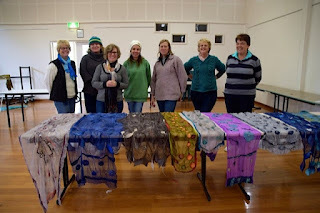 Over the two days everyone made a wrap and scarf or two wraps. The designs and resulting art pieces are truly breathtaking. So, a quick rundown of the process. We had some beautiful colours of silk chiffon fabric to choose and then some toning or contrasting wool tops and silk threads. The tops could be feathered or shaped or rolled and laid onto the silk and the silk threads laid onto the wool. This was then felted by applying tepid soapy water and massaging the fibres. The piece was then rolled, and rolled, and rolled, and rolled, you get the picture. Then unrolled and hey presto what jewels unfolded. Clearly those present also shared a love for our region, with local plant species and landscape colours featuring in the felting. 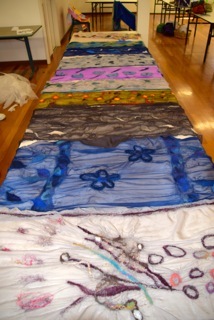 Seeing all the pieces displayed in the hall at the end of the workshop gave all a great sense of achievement. Thanks to Ravensthorpe District Art Group for organising this event, RRAC for assisting with costs, and Sue Leighton for the photography. Some of the finished art pieces will be on display during Wildflower Show exhibitions from 13th - 24th September. If others are keen to explore felting please make contact with either the RDAG or RRAC. If ever a Wheelie Bin looked appealing, it was on Friday 27th May at the Hopetoun Community Centre Hall. If you've ever thought that a Wheelie Bin could be entertaining (legally), then your not alone. If you bought a ticket to the Trash Test Dummies expecting a good laugh, then by Jingo you got what you paid for! Before the show had even begun, the rascally Trashy Trio had snuck out to pester our good standing citizens in the foyer! 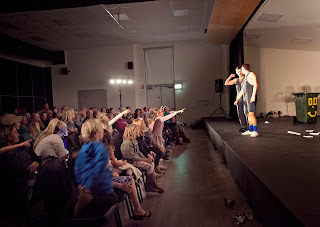 Their highly animated antics continued into the seated audience, climbing over and weaving though children and adults alike. No one was safe from their cheeky behaviour, not even our local Police Sargent! Simon Wright, Isaac Salter, and Jamie Bretman aka The Trash Test Dummies, were very entertaining. Through a mixture of circus, acrobatics, and character play, the Trash Test Dummies led the audience with intrigue into a world of slapstick comedy. 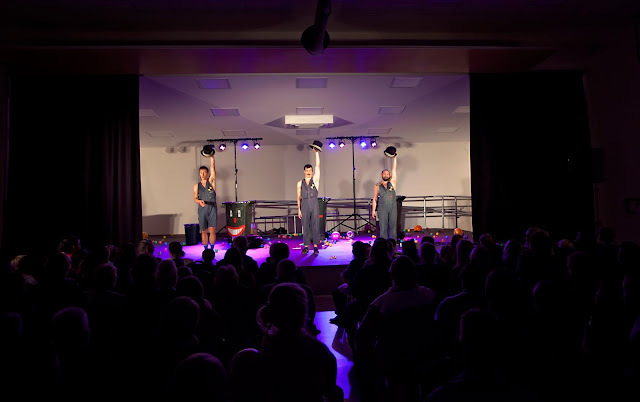 Their very interactive show was clearly popular with the children who needed little encouragement to join in with ball throwing, and verbal support. 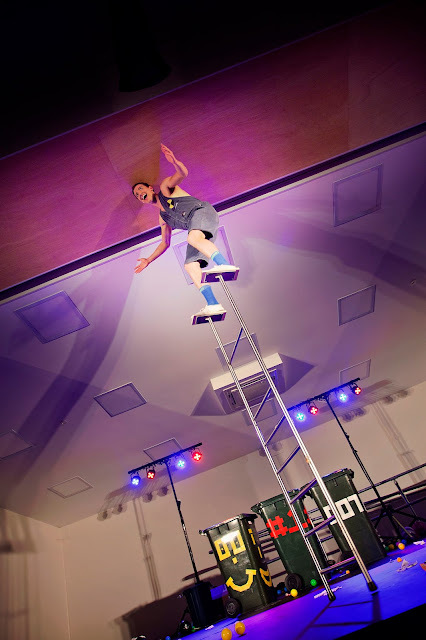 After much acrobatic activity and wiggling of the derriere, the dextrose Dummies performed a gentlemanly hat routine, at a much preferred pace for some audience members. Not to let comedy get in the way too much, they showed off their skills in so many different ways it was hard to keep up. From slow motion fluid body movements, to trio juggling whilst drumming (of course, whilst drumming). It was obvious that the skills that attributed the Trash Test Dummies were gained from years of dedication and training. We laughed, we sat in awe, and we cringed. An absolute spectacle for all ages. 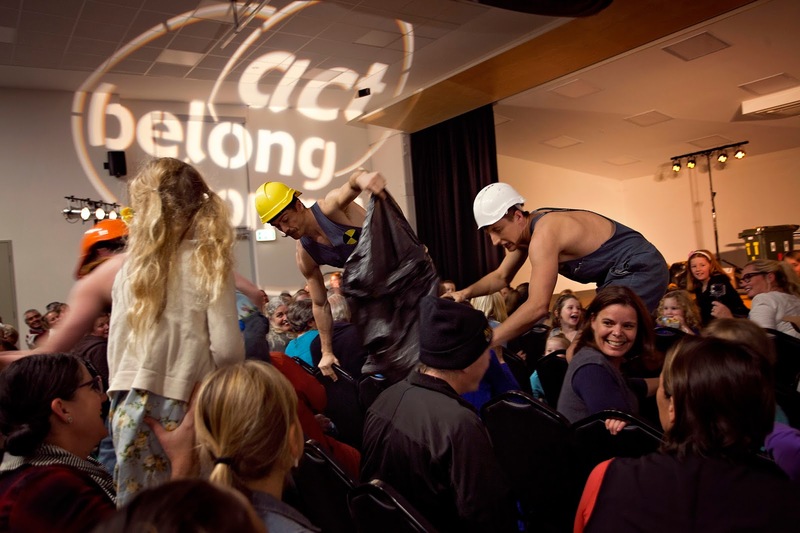 The mood was high as the Trash Test Dummies mingled with the audience after the show. Delicious take away dinners were whisked off home (Thank you Hopetoun Primary P&C) with happy kids in tow. Who can't wait to see what the Ravensthorpe Regional Arts Council has in store next...?